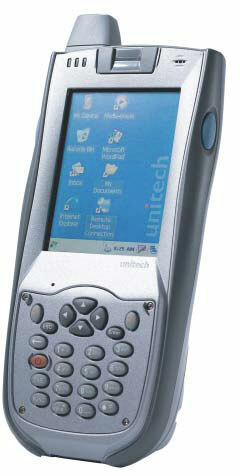 The Unitech PA968 mobile computer is designed for workers outside the four walls. Utilizing the built-in GPS tracking system with wireless capability, the PA968 can quickly and seamlessly transmit collected data to a server and enable tracking and tracing whenever it may be required. Data will be secure as the PA968 is equipped with a large memory capacity that can easily accommodate massive amounts of data without requiring any additional accessories. This versatile mobile computer scans 1D or 2D barcodes to authenticate a user's identity to protect privacy and confidential data. The Unitech PA968 also offers multiple customized applications through the embedded Windows CE 5.0 operating system, making it ideal for a wide range of applications in transportation logistics, law enforcement, or field service based enterprises. The PA968 also offers two intelligent and user-friendly modularized keypads, providing a more convenient and cost-effective solution for special keypad requests. Stylus, 1 Pack, Compatible with Unitech HT680, HT682, PA690, PA692, PA968. The Unitech PA968-95612ALG is also known as UNI-PA968-95612ALG	or PA96895612ALG	.